Wine Spectator rating 90. Presents a deeply dark violet color with blackish tones. The nose is full of ripe black fruits with floral tones and touches of leather, vanilla, and spice. The mouth feel is full yet supple, with juicy black raspberry, black cherry and black currant fruit layered with notes of violets, black pepper and tobacco. 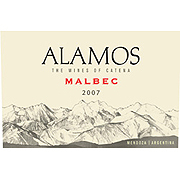 The finish is long and lingering, with soft, velvety tannins and bright, refreshing acidity. "Round and fleshy, with enticing spice, blueberry, fig and boysenberry flavors backed by fruitcake and melted licorice hints.